The “clean” eating trend currently upon us is good…and bad. Good in encouraging awareness of the quality of the ingredients in the food we eat. Very bad in leaving many people feeling guilty if they don’t eat perfectly wholesome, natural, organic, vegan or clean 100% of the time. For some, it’s creating a fear of food – particularly of items from the inner core of the grocery store. Even contributing to a serious eating disorder known as orthorexia. Recently, several absolutely lovely, smart, fit, educated, talented mothers raising kids have shared with me that they feel guilty buying anything that isn’t an organic vegetable or free-range protein. This is not a healthy situation. For all sorts of reasons ranging from scientific evidence and world food sustainability to enjoyment and affordability, I stand my ground firmly when encouraging an 80-20 approach to food choices. I also continue to support the notion that the majority of what fills our shopping cart should come from the outer perimeter of the store – fresh fruit, vegetables, wholesome grains and baked goods, quality protein and milk products (vegetarian versions or not). Are there some real lousy foods in the aisles? Yes absolutely! But not all. There remain MANY excellent, affordable, wholesome options from what they call ‘centre of store’ in the grocery biz. You don’t need to feel like you have to wear a bag over your head and hide when venturing in there to choose foods for your family. These foods still come from farms. And food remains just one of the many spokes in the wheel of health that also includes being active, managing stress, good sleep, self-esteem, genetics and much more. Dried or canned pulses – aka legumes – such as lentils, chickpeas, black beans, kidney beans and others. See lentils.ca for amazing recipe ideas. Canned wild salmon. And if you’re really seriously after omega-3 fatty acids, sardines and herring too! Canned tomatoes. Often more tasty than fresh in the winter months and still a great source of nutrients. Whole grain cereals. Yes, you can find sugar-laden chocolate bars disguised as ‘breakfast’ in the cereal aisle, but you can also find fibre-rich, nutritious options. A quality cereal with milk also makes a great snack choice for growing kids. And honestly, those little 8-packs of mini cereal boxes are a mighty special, fun treat on a camping trip! Canned pumpkin (the pure stuff, not ‘pie filling’). A vitamin-rich, delicious ingredient when baking muffins, loaves and even pancakes. Dried prunes, cranberries and raisins (and other dried fruit). Great in baking and in a homemade trail mix. They’re super pantry items to keep on hand for a source of fruit when you run out of fresh or have just returned home from a vacation and haven’t had time to shop yet. Nuts and seeds. Tremendously important protein, fibre and nutrients. Soup stock. Homemade soups are one of the simplest, most affordable, delicious and nourishing meals you can make. Look for reduced-sodium and preservative-free options. Same if opting for a ready-to-eat soup. Coconut milk. No magical powers in my opinion, but a delicious natural ingredient to have on hand for cooking savoury dishes. Canned peaches, pears or other fruit. Especially in the dead of winter, adding canned fruit to a fresh fruit salad is a great way to make it more naturally colourful and tasty. For example, fresh bananas and kiwi with canned peaches or fresh apple and orange pieces with canned pears. Sugar-free applesauce is another nice option here. 100% real fruit juice. A great option for normal (or underweight) highly active kids. Also a helpful ingredient to have on hand for making real fruit smoothies or popsicles. For single serving use, avoid buying bottles or cans that are larger than a cup (250 mL or 8 ounces). Baking ingredients. Assuming you use them for baking rather than late-night snacking most nights, keep a supply on hand (flour, sugar, baking powder, vanilla, chocolate chips, etc). When the urge to whip up a batch of wholesome cookies or muffins hits you or the kids, especially in cold, icky weather, the supplies are available and you won’t opt of the healthy experience of baking because it’s too miserable to run out to the store. Coffee. Make it at home. Keep portions normal, not turbo-sized, and avoid sugary syrupy additions and expensive average-quality or over-sugared baked goods that can tempt even the most committed of us in the coffee shop lineup. Black tea, green tea and/or herbal tea. It’s tea season for sure, but also make your own iced teas come the hot weather. Pantry staples for cooking: vegetable oils (canola, olive, nut oils), vinegars, dried herbs and spices, honey, etc. Rice, pasta, quinoa, barley, millet…any whole grains you like. Popcorn kernels. Make popcorn at home for a fibre-rich snack. Fermented foods. They’re good for gut bacteria. Sauerkraut, real pickles and kimchi, for example. If you’re having a party, you may even want to pick up things like birthday candles or potato chips! Still no bag over your head required! As to the instant ‘lunch’ and noodles pictured above, I don’t consider these particularly ‘good’ deals. Cheap prices but also cheap, low-nutrient food. I don’t really see any redeeming qualities in those little ‘lunch’ packages amidst their salt, fat, lack of fibre and plastic over-packaged-ness. A tiny bit of fun maybe??? A homemade version will always be better – and MORE fun. Ichiban-style noodles? Definitely not a whole, fibre-rich grain. I don’t recommend them as a ‘good staple’ like I overheard a couple telling their home-stay college student in the grocery store?!? That was in September back-to-school season when they were 19 cents a package. Seriously! Still, I won’t judge you if you eat them. Personally, I need to look after nourishing my own family. 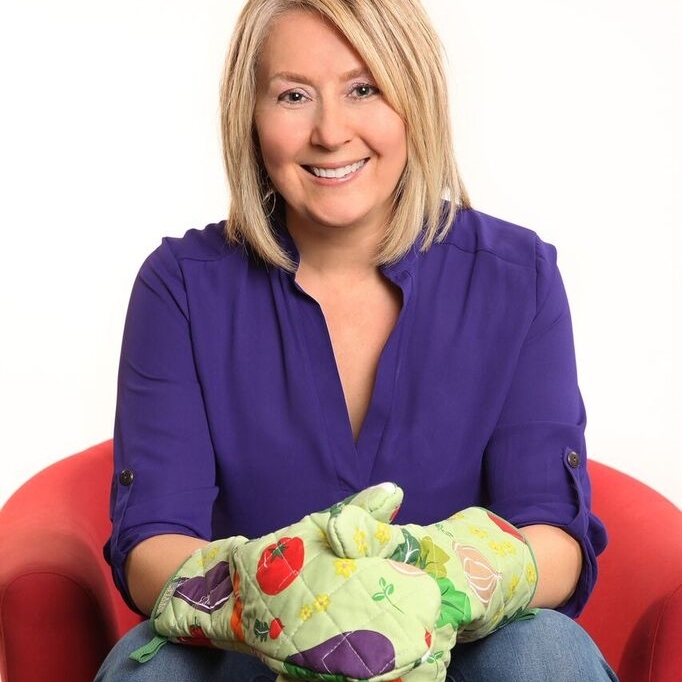 Professionally, as a responsible dietitian and member of the only regulated group of nutrition professionals in Canada, I want to keep being a trusted source you can consult for healthy and practical ideas and one that helps you feel calm and confident as you stroll through the store selecting foods to MAKE and ENJOY with your family. PS – Not everyone will agree, but if the instant noodles are among the first foods that your young kids temporarily get practice with in ‘cooking’, the I.K. gained (kitchen intelligence) FAR outweighs drawbacks of the product. They’re ready quickly for impatient kid chefs. If the kids move on to add vegetables and protein to these noodle mixes, even better! When the noodles are replaced with whole grains in a fully homemade soup, mission accomplished! Some food products have become like cosmetics. You pay extra for trendy, attractive packaging that makes you look cool in the check out line and might even connect you to the product emotionally. Many so-called ‘clean’ foods fall in this category. Stay smart and don’t be fooled by 3’s dressed up as 9’s, like the band Trooper would say. Example, many ‘energy’ bars.